Substitute Jason Cummings ensured 10-man Luton set a new club record of 28 league games unbeaten by salvaging a late and dramatic point against Blackpool this afternoon. With just four minutes to go, it looked like the Hatters were about to lose for the first time since October 13, trailing their opponents 2-1. But Cummings showed his predatory instincts in the box, taking Pelly-Ruddock Mpanzu's pass before finding the bottom corner to score a crucial first goal for the club. Town almost won it as well, fellow sub George Moncur going through in the last minute of stoppage time, only to see his shot smothered by keeper Christoffer Mafoumbi and defender Ben Heneghan. That Luton were even in the position of contemplating defeat was mind-boggling when you consider the utter dominance they had in the opening 25 minutes. But after drawing level, Blackpool then cleverly closed the gaps in their defence, and threatened to make the most of James Collins' red card on the hour, only for Cummings to strike. An unchanged Town got off to the perfect start with just six minutes gone, Kazenga LuaLua spinning his man wonderfully on the left and delivering a low cross that saw an alive Collins sweep home. There were question marks over keeper Mafoumbi, who surely could have done better, but Town's leading scorer didn't care a jot, celebrating his 22nd goal of the season. LuaLua was rampant in the opening 15 minutes, producing nutmegs and wonderful turns away from danger, the home supporters lapping it up. Matty Pearson almost had an instant second, his header from James Justin's corner deflecting away off a covering defender. 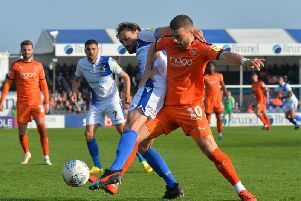 The game then became something of a training exercise in attack versus defence, Blackpool unable to get out of the own half, desperately holding on at times, as Luton appeared to have double the players out there. Another glorious move saw Andrew Shinnie drive into this box, his shot charged down, but out of nowhere, the visitors drew level on the half hour. Matty Virtue got away on the left and as James Shea came out, he turned away from goal, miss-hitting a cross that Nya Kirby superbly volleyed from 20 yards beyond the retreating keeper and into the corner. Much improved now, the visitors started the second period well too, Shea making a superb save to keep Town level, getting down low to prevent Gnanduillet's glancing header from Liam Feeney's cross creeping in. The visiting striker went close again moments later, rising above Pearson to head goalwards, Sonny Bradley back on the line to hack clear. They could also consider themselves unlucky not to win a penalty too, Marc Bola chopped down in the area, but referee Lee Collins gave nothing. Back came Luton, Shinnie's volley destined to hit the net but for Curtis Tilt's intervention, while Justin's low corner was half volleyed skywards by Collins. A quiet and seemingly injured LuaLua was replaced by George Moncur, as Town were dealt a huge blow when they were reduced to 10 men with half an hour to go. Collins, who had just seen yellow for kicking the ball away, made a lunging challenge on Virtue, giving his namesake very little choice but to reach for his top pocket. Things went from bad to worse moments later, as the visitors moved in front, a corner not properly cleared and Virtue hammered home from close range, only the second set-piece that Luton have conceded from this season. Now 10 v 11, Town could easily have levelled quickly, Justin escaping on the left and Elliot Lee, who had been moved up top, slicing well wide. Shea made sure Luton were still in the hunt with a crucial save on 72 minutes, as Blackpool engineered a two-on-one situation, the keeper came out to save with his legs from Gnanduillet's close range attempt. Sub Moncur was wide from the edge of the box, as Town boss Mick Harford threw on both Harry Cornick and then Cummings. It was the latter who proved to be the hero, taking a pass from Mpanzu, who stepped up to the plate massively in the final half hour, driving his side forward time and time again, and beating Mafoumbi. Luton somehow almost won it as well, Cornick releasing Moncur at the very death, but he couldn't quite bring the house down. The result saw Luton move a further point clear of Barnsley, who lost for the first time since December 8, going down 3-1 at Burton Albion. However, Sunderland are now also eight points behind, with two games in hand, stealing a late winner to triumph 2-1 at Rochdale, while Portsmouth are in with a shout as well, beating Wycombe to trail Luton by 10 points, also with a game in hand. Hatters: James Shea,Jack Stacey, James Justin, Matty Pearson, Sonny Bradley (C), Pelly-Ruddock Mpanzu, Andrew Shinnie, Luke Berry (Harry Cornick 74), Elliot Lee (Jason Cummings 82), Kazenga LuaLua (George Moncur 59), James Collins. Subs not used: Harry Isted, Alan Sheehan, Alex Baptiste, George Thorne. Tangerines: Christoffer Mafoumbi, Ben Heneghan, Nathan Delfouneso (Chris Long 88), Jay Spearing ©, Curtis Tilt, Matty Virtue, Ollie Turton, Armand Gnanduillet, Nya Kirby (Jordan Thompson 68), Liam Feeney (Harry Pritchard 82), Marc Bola. Subs not used: Donervon Daniels, Antony Evans, Michael Nottingham, Nathan Shaw. Booked: Delfouneso 50, Turton 64, Collins 59, Kirby 66, Long 90.